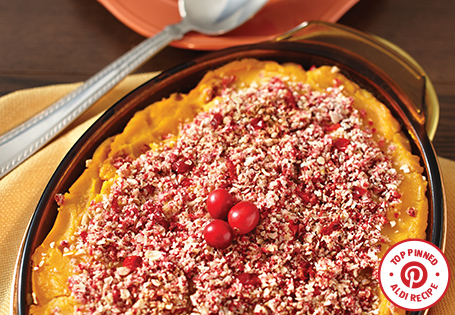 A healthy approach to holiday yams. Lightly coat butternut squash with 1 tablespoon olive oil. Place cut side down on a parchment-lined baking sheet. Bake in oven for 45 minutes or until fork tender. Allow to cool slightly. Remove flesh of butternut squash and place in blender along with the rest of butternut squash ingredients. Lightly coat a casserole dish with cooking spray. Transfer squash mixture to the dish. In a blender, combine crumble ingredients, pulse until pea size. Spread evenly over the squash mixture. Drizzle with remaining 2 tablespoons olive oil. Bake for 20 minutes until mixture is bubbling and crust is golden.